Written by one of the best metal fabricators in the business. Thoroughly outlines the correct procedures to form aluminum, steel and stainless steel. 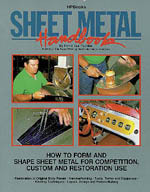 Chapters include sheet metal equipment, bldg. sheet metal interiors, layout, design & pattern-making, metal shaping, hammerforming & much more.